Hunters Point is the neighborhood most people mean when they say Long Island City. 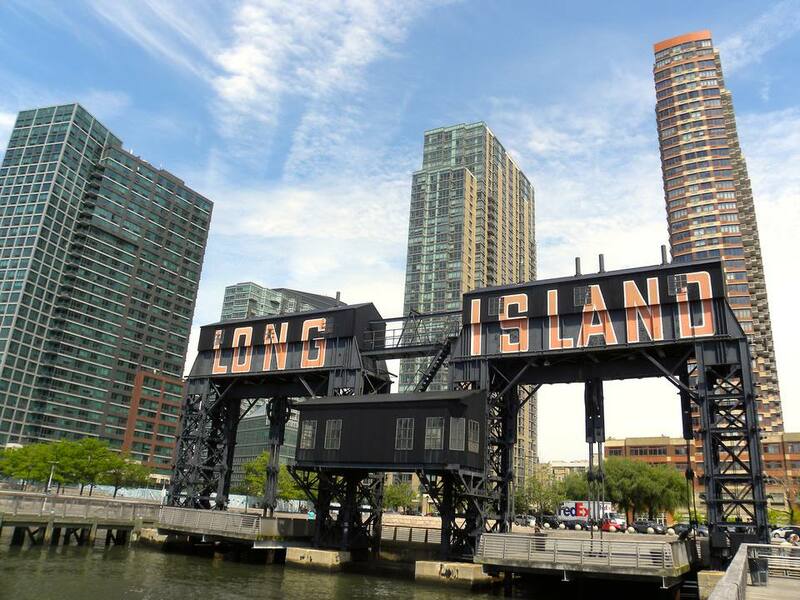 One subway stop from Midtown, this working-class and industrial neighborhood is transforming into a premier residential enclave with the housing prices to match. The East River waterfront defines Hunters Point, through its factories, its brilliant views of the Manhattan skyline, and now its ads for future condos. The biggest banners of change are the Queens West towers and the Citibank tower. The East River and Newtown Creek meet at Hunters Point. To the west is Manhattan, with the UN and Chrysler Building at spitting distance. South is Newtown Creek and Greenpoint. To the east are the railyards and Sunnyside, and north is Queens Plaza and Dutch Kills. The main drag Vernon Boulevard is all restaurants, bars, and shops until about 47th Ave, where warehouses take over. Wide Jackson Avenue is a major thoroughfare, with a more industrial-commercial mix, leading to Court Square. The #7 subway makes its first Queens stop in Hunters Point, about five minutes from Grand Central. The G carries folks between Queens and Brooklyn. The E and V subways meet at Court Square. The LIRR has limited service at Borden Ave and 2nd St. The neighborhood peers into the mouth of the Midtown Tunnel, which brings the LIE to Manhattan. From nearby Queens Plaza, the Queensboro (59th Street) Bridge is a free way to Manhattan. NY Water Taxi connects Hunters Point to Wall Street's Pier 11. Housing runs the gamut from ultra-luxe to industrial mess, often next to one another. The trend is up and away for renovated properties, but development has not kept up with demand. Apartments: 1-bedroom, $1100 - $4000. 2-bedroom, $1500 - $7000. 3-bedroom, $2100+. Queens West's Citylights (condos) and Avalon Riverside (apartments) are Hunters Point's premier housing. Avalon's rental rates range widely and wildly depending on floor and view ($2000+). Hunters Point is generally a safe neighborhood, though the more desolate areas, especially toward Queens Plaza, are best avoided at night or when you're alone. Same is true for the industrial areas south of the LIE. They can be too empty at night. P.S. 1 Contemporary Art Center opened in 1971 and has become the catalyst of neighborhood transformation. Housed in a former public school, it stays on the cutting edge, even as it has gained international prominence. Make sure to check out its wild summer weekend party, Warm Up. (46-01 21st St). Red-brick, 19th-century brownstones line 45th Avenue between 21st and 23rd Streets and are now a historic district (recent sales near $1 million). LIC's beautiful firehouse and police station are in the TV series Third Watch. Court Square is home both to the Citi Tower (which at 58 stories is the only skyscraper in Queens) and to the NY State Supreme Court House. Gantry Plaza State Park at the Queens West waterfront is a simple, small, almost perfect park for enjoying the East River views. Hunters Point has been about transportation since 1861 when the LIRR moved its main terminus here from Brooklyn. Train travelers disembarked and boarded ferries to Manhattan, and a community developed serving this trade. By the 1870s Hunters Point was residential and joined Ravenswood, Astoria, and Steinway to form Long Island City. In the early 1900s, the neighborhood changed again, as the elevated subway and the Queensboro Bridge promoted industry, which has dominated until recent years. Hunters Point problems: The biggest neighborhood issue is the environmental impact of the Queens West development of former industrial sites. Clean-up is especially complicated at sites with long histories such as the former Pepsi bottling plant, which had once been a Standard Oil refinery. Shopping: Small stores (more mom-and-pop than chains) line Vernon Boulevard. Elsewhere it's hit or miss. Library: Court Square Branch, 25-01 Jackson Avenue. Parking: Main streets and side streets are tight. Watch out for tow zones. Park in the Citylights building garage, 48th Ave and 5th St, Long Island City, NY. Post office: 4602 21st St, in a beautiful building. Hospital: Mount Sinai Hospital of Queens, 25-10 30th Avenue, Long Island City, NY. Movies: New Center Cinema, 4217 Queens Blvd, Sunnyside. Police station: 108th Precinct, 5-47 50th Ave, 718-784-5411, Third Watch is filmed in this beautiful police station. Community Board 2: 43-22 50th Street, Woodside, NY 11377.
Business organizations: Long Island City Partnership sponsors networking, small office spaces, and the arts in LIC. Queens West: The development of the Queens waterfront in Hunters Point is run by the Queens West Development Corporation, a subsidiary of New York State's Empire State Development. Health club: Astoria Sports Complex has a pool and batting cages, in addition to the typical gym offerings, 34-38 38th St.